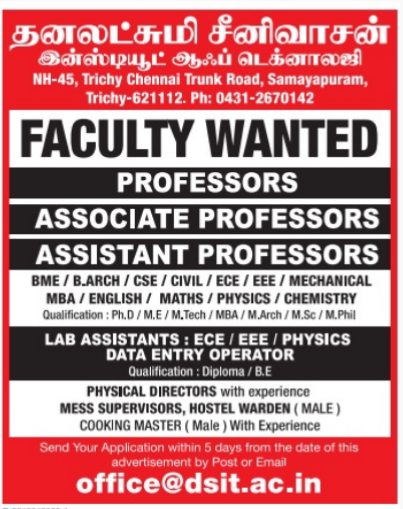 Dhanalakshmi Srinivasan Institute of Technology, Trichy, has advertised in THE Dinamalar newspaper for recruitment of Professor/Associate/Assistant Professor jobs vacancies. 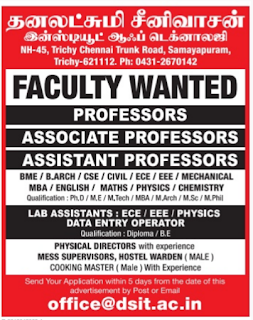 Interested and eligible job aspirants are requested to apply with in 5 days. Check out further more details below. About College: Dhanalakshmi Srinivasan Institute of Technology was established in the year 2012 under the aegis of Srinivasan Health and Educational Trust whose members have had consummate experience in the fields of education and industry. As per AICTE norms will not be a constraint to the right candidates. Dhanalakshmi Srinivasan Institute of Technology,samayapuram, Trichy, India.